The thing that makes Pocket Legends impressive is the fact that it's a 3D MMO on the iphone and ipod touch. It is literally a MMO that will fit in your pocket. The game design may be simplistic, but it is still a first of its kind. 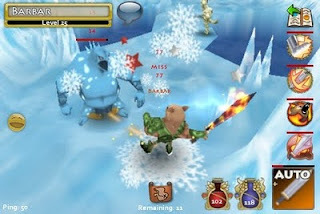 Pocket Legends has all the trappings of a normal MMO. There is grouping, character progression, leveling, gearing up, and killing monsters. For being a MMO that can fit in your pocket it is pretty impressive. I don't know how much time I could kill playing this game and it's definitely not something you need to run out and buy, but I would recommend taking a look if you are a fan of the genre. Spend a few minutes and see the precursor to many pocket MMOs of the future.